Olympus today announced the OM-D E-M5II camera, a curious update of the E-M5 that in some ways leapfrogs the E-M1, in other ways doesn’t. The big news here is that the camera uses an electronic shutter and its sensor IS system to move the sensor for tripod-based static images that generate more megapixels. The camera manages a whopping 64mp (9216 x 6912) in 12-bit ORF files, or a somewhat smaller 40mp (7296 x 5472) when shooting JPEGs in this mode. Essentially the E-M5II takes eight shots and combines them in this mode: one with the sensor aligned to each of the four Bayer positions (i.e. full pixel shift), and four more in the corners between the Bayer positions (i.e. half pixel shift). As a result, every color is sampled at every pixel location. Because this is a mechanical system producing the extra information, I’ll be curious to see how precise and repeatable its capabilities are. I have this suspicion that artifacts will be commonly encountered, as will noise (the system also uses the electronic shutter of the sensor, thus the noise increase). Note also that this mode is limited to ISO 100 to 1600. One thing to note: no raw converter is yet available to handle the 64mp version of the sensor shift files. Olympus is working with Adobe and others to make such conversion available in the near future. Update: RPP on the Mac can handle the files. Also, I’m told that the shift is done via underexposed shots. In other words, the overall exposure is not 8x the shutter speed. Olympus started with the basic E-M5 body, gave it a few E-M1 inspired control changes, added a fully pivoting 3” rear LCD, upgraded the EVF to the E-M1’s, and upped the mechanical shutter to 1/8000 (and 1/250 flash sync with some flashes). Those are the big changes. Smaller changes abound, too. The video has been upgraded to perform 1080P/60 at 52Mbps, a standard mini-jack for microphones has been added (as well as a headphone jack if you use the optional grip), the separate mini-flash has been upgraded with a higher GN (9.1m at ISO 100), while continuous frame rate rises slightly to 10 fps (but without continuous autofocus or IS). Weight of the camera is up slightly, though size is not. The camera comes in panda (silver/black) or black variations, sells for US$1099, and will be available later this month. Okay, time for a rant. What the heck is Olympus thinking? 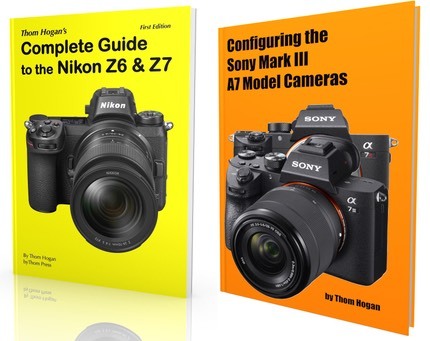 We now have three “current” DSLR-like cameras from them and we have different batteries (EM-10), different control placements (all three), and extremely similar specifications except for something they hold unique for each one (E-M1 phase detect, E-M5II sensor shift megapixel gain, E-M10 very small size). Throw in the original E-M5 and we have a fourth variation of control placements. Personally, I can’t move from one OM-D to another without thinking about which one I have in my hand. Which is it, Olympus? Mode dial on the left or right? Viewfinder/LCD switch next to the viewfinder or on the top of the camera? HDR button on the left top or right top? Menu button below the Direction pad or above? 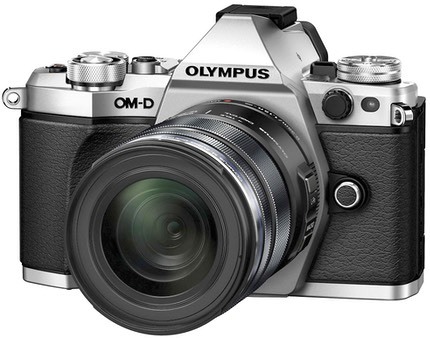 What we have in the Olympus cameras is designer laziness and a total ignoring of customer. Does Olympus really want to build brand loyalty? Do they really want someone to build an Olympus system? Because it sure doesn’t look like that to me. I can’t exactly use a combo of EM-5II and EM-1 as my main and backup bodies because of the cognitive dissonances in designs. Olympus iterated the E-M5 with the sensor shift rather than making an E-M2 with sensor shift why? Because it was easy from an engineering standpoint. Work on the E-M5II could start before the E-M1 was complete and in customer hands. I happen to like a lot of things that Olympus has done with their DSLR-like m4/3 cameras. What I don’t like is how customer unfriendly the sequence has been, and how the primary thing that every Olympus user tends to complain about—the menus—still hasn’t been addressed in five years of producing m4/3 cameras. Yes, we know you’re great engineers when you’re playing with technology at its primal level (e.g. the sensor shift trick, the five-way stabilization, etc.). What’s problematic to me is that things that should have been addressed and realigned from the customer point of view just aren’t happening. Instead we continue to get controls that shift around between models, even more density and confusion in the menus, eyepieces that still fall off in use, and much more. Things that would make the Olympus cameras more compelling to use on a day-to-day basis just aren’t happening. I know far too many folk who sampled an Olympus m4/3 camera only to give up on it because it wasn’t as approachable and learnable as something else. And Olympus wonders why they can’t sell more than 500k units a year. This iteration for iteration sake, controls can be moved anywhere between models, and who cares if anyone can understand our menus attitude has got to stop. The E-M5II should have been an E-M2. Same controls in the same place, an iterative feature that moves the model line forward. Oh, but wait, says Olympus off the record, there will be an E-M2, and it will have the sensor shift and another new piece of tech. Right, and controls will move again and the menus not addressed, and I’ll be on my tenth eyecup. Phew. Glad that’s off my chest. Because there’s a lot to like about the E-M5DII, and if the sensor stitch trick works well, it totally blasts through the 16mp wall Olympus has been stuck at, albeit only for static subjects. Plus the full swivel LCD is a very welcome touch, and it looks as if Olympus finally stepped up to the plate and fleshed out the video side, as well. The Olympus shooting community seems a bit mixed in reaction to the E-M5II on initial impression. On the one hand I see some that are excited about the extra pixels for static shots. On the flip side, I see quite a few that are dubious about how they would use that and wonder why they’d give up their E-M1 for the E-M5II. After all, the E-M5II doesn’t have phase detect autofocus, and basically only matches the E-M1 on most other things. Meanwhile, the news on the lens front from Olympus was a little less exciting than I’d hoped. Olympus announced the development of a new 8mm f/1.8 Pro fisheye lens, while the 7-14mm f/2.8 Pro and 300mm f/4 Pro lenses remain only on the horizon for later this year. The 14-150 variable aperture lens got an upgrade that improves its flare and weather performance, but that’s not exactly a great match for the high-end, DSLR-like OM-Ds that the company is cranking out. It’s those Pro lenses that will define whether Olympus’ high end m4/3 strategy is going to work, and with it, their entire m4/3 strategy. The fisheye is less important than the 7-14mm or 300mm in that respect.